To enter to win Scenery: Mini Scenery: Multifaceted + My Precious + Sparkle + True + Cover Model: Multifaceted Cutaway...continue reading! Today we bring you elegance, glamour and shine! 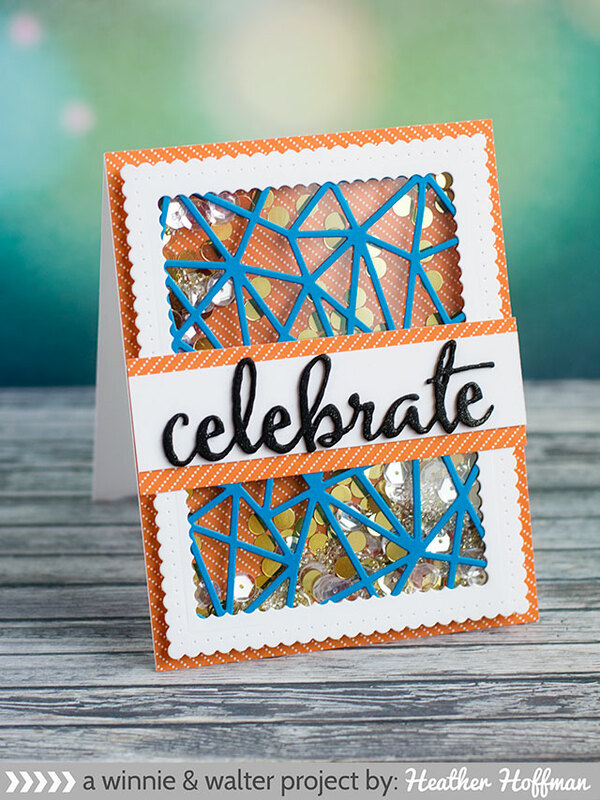 Mini Scenery: Multifaceted is our latest 3x4 background stamp. Perfect for smaller projects or just as a layer or smaller focus, this gender-neutral background will add just the right geometric touch! 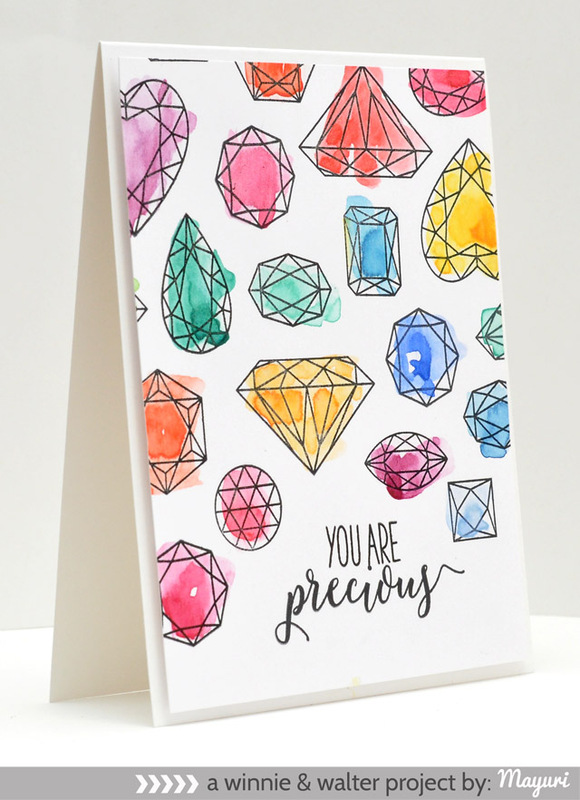 My Precious brings you lots of gems with sentiments to show how precious the people are in your life. Designed to work well with Mini Scenery: Multifaceted, Sparkle and True you will love this gem of a set. 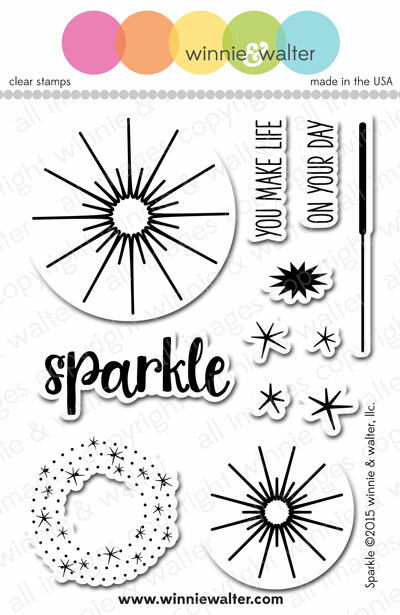 Sparkle is a small, but gorgeous little set that can be used for any celebration like Independence Day, New Year's Eve or everyday to add something extraordinary to the ordinary. 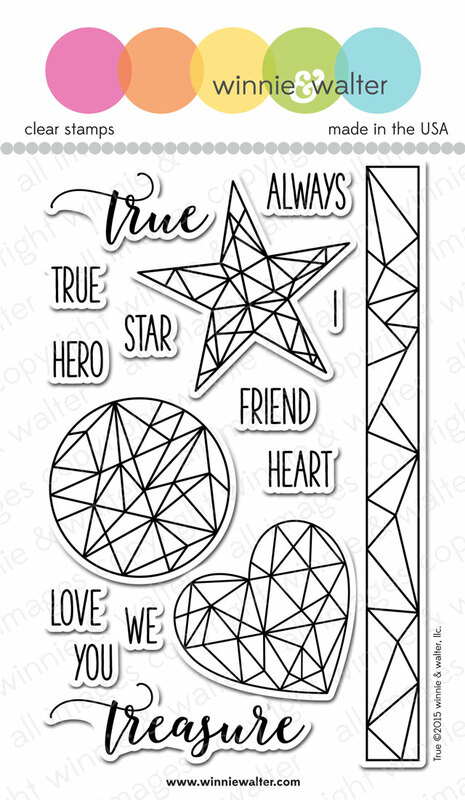 True is all about graphic basic shapes and words to celebrate your true friends, heroes and loves. This set works well with Mini Scenery: Multifaceted, My Precious, Sparkle and our brand new Cover Model: Multifaceted Cutaway! 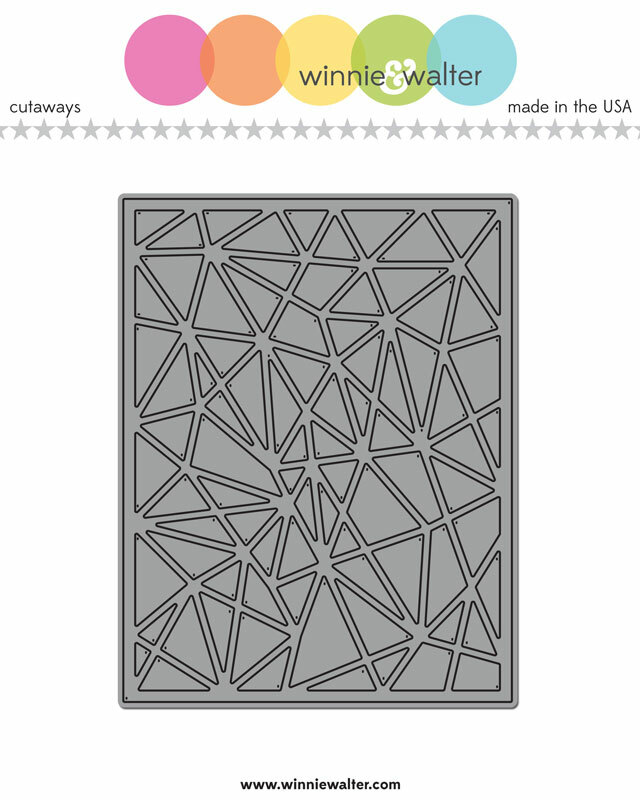 Cover Model: Multifaceted Cutaway is our first A2 sized die. If you wish to have a border around the die simply trim a little around the border. Great paired with feminine or masculine accents this design is very versatile. 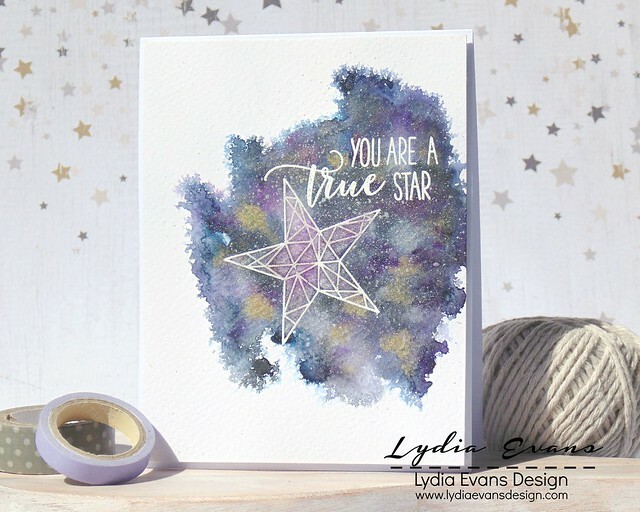 Let's get to the fun part and see what our guest stars, Maria F. & Maya Isaksson (our fabulous winners of our 1st Birthday Bash challenge), Lydia Evans (our April Leading Lady), + Anita in France (our May Leading Lady) and The Talent (our supernova creative team) made with the products. And make sure you visit Maria's, Maya's, Lydia's, Anita's and each of The Talent's blogs for more knock-it-out-of-the-park projects and details. Don't forget to share some love with them too! I have 3 cards for you today that I hope you will enjoy. I really wanted to use Cover Model: Multifaceted Cutaway so this is a card built around that plus I also wanted to play with In Bloom: Maggie's Roses Cutaways. I went graphic + pretty on this card mixing the two visual themes of this release together in one card and I love it. I cut the Cover Model: Multifaced Cutaway out of a pink ombre piece of patterned paper from the 6x6 paper pad from cut & paste "adorbs" by My Mind's Eye. I curled up the edges a little. On a watercolor paper panel I used Tim Holtz Distress Inks in squeezed lemonade, mustard seed, shabby shutters and crushed olive and the ink blending tool to color the panel. Then I flicked water on it which I let dry and then I flicked drops of calico white Mister Huey's Color Mist. I adhered the ombre cutaway in just a few placed upon the yellow-green panel. I cut out of water colorpaper the In Bloom: Maggie's Roses Cutaways. 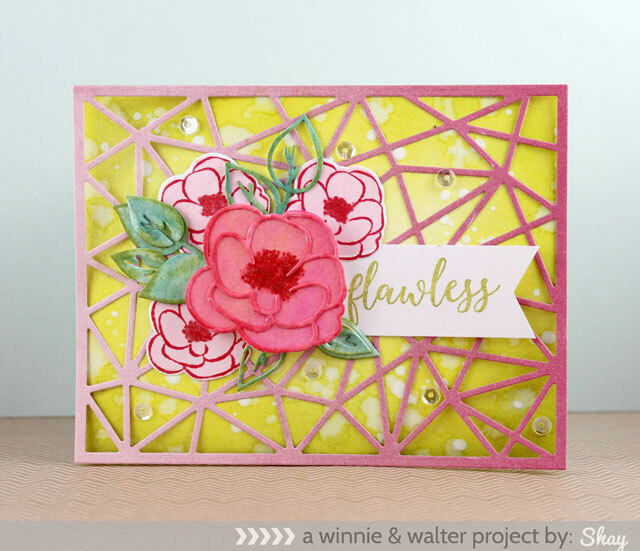 I colored in the rose base with picked raspberry and dried marigold Distress Inks using a water brush and the outline with festive berries Distress Ink along with stamping the center in several times using a center stamp from The Big, the Bold and Extras. I adhered the outline to the solid rose. On the leaves I used evergreen bough and pine needles Distress Inks and then went over them with olive vine chalk ink by Prima. I adhered a few of the outlines and insides of the leaves on the base leaves. I also stamped and then cut out the solid more open rose 3 times from The Big, the Bold and Extras in spun sugar Distress Ink and then stamped the outline and center with festive berries Distress Ink. I used the brand new The Big, the Bold and Extras Cutaways to cut out the flowers. It was so easy! On a piece of white cardstock I stamped the sentiment from My Precious using the olive vine chalk ink by Prima. I cut out the banner edge. Then I added dimensional foam adhesive to the large rose, placed the sentiment banner under it and tucked in and adhered the smaller roses and leaves around it. Last I added some clear shimmery sequins. I stamped the heart 9 times on a piece of cardstock in light grey ink. Then I watercolored 3 of each gem in 3 colors: evergreen bough, picked raspberry and musterd seed Distress Inks. 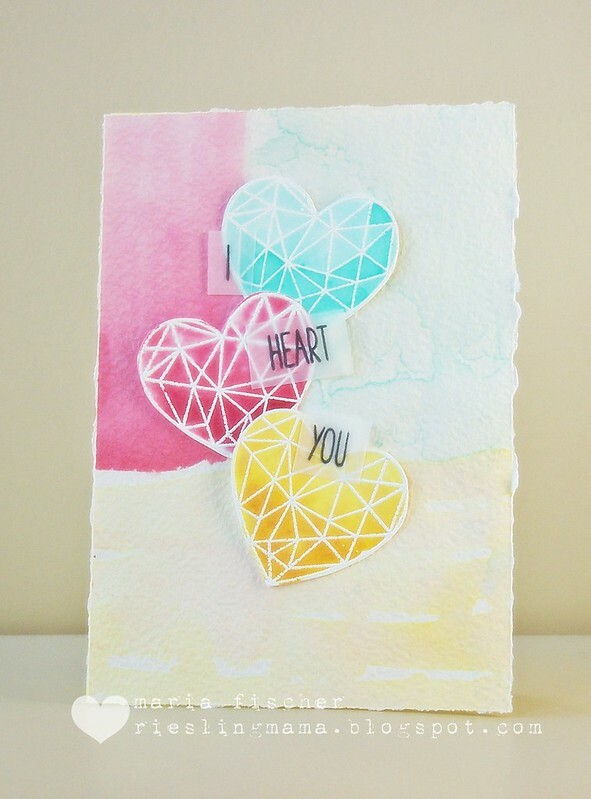 After they dried I over stamped the heart gem in the same inks. 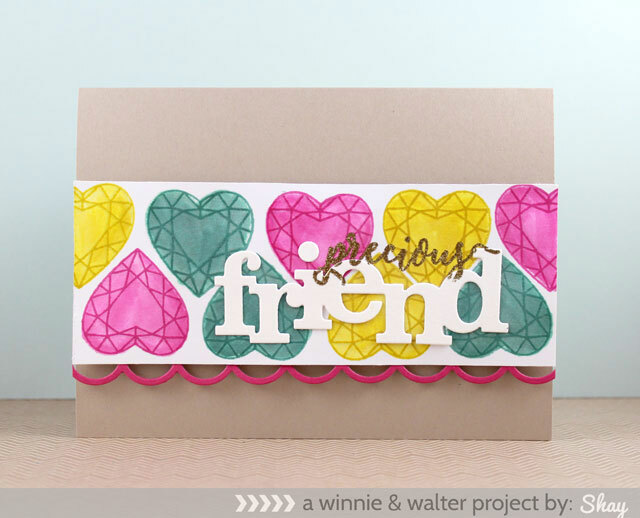 I cut out In a Word: Friend Cutaway from white cardstock. I adhered it over the gem panel. Then I stamped the sentiment from My Precious in Versamark and heat embossed it with Zing! glitter finish gold (somehow some of the embossing powder chipped away--I sometimes have this problem with this particular embossing powder + the powder I use to lessen embossing powder sticking to anything but the Versamark). I added the scallop from Goldie Trim Cutaways to the panel and then adhered it to a kraft card base with dimensional foam adhesive. I wanted to do a father's day card because several of the items featured today are perfect for that and masculine cards in general. On a panel of white card stock cut using the smaller rectangle layer in Essentials: Katharine Cutaways I stamped in Versamark Mini Scenery: Multifaceted and heat embossed it in white. I colored in the facets using: tumbled glass, stormy sky, faded jeans, broken china, salty ocean and chipped sapphire Distress Inks with a water brush. 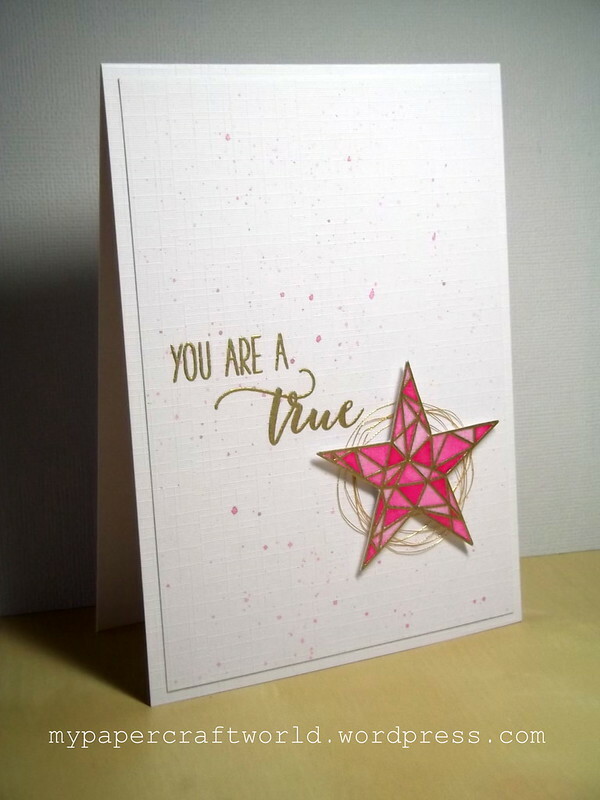 I stamped the star from True in Versamark and heat embossed in white. Using tumbled glass, broken china and faded jeans I colored in the star with a water brush. On a piece of bright blue cardstock I stamped "dad" from The Write Stuff: Leave it to Dad in Versamark and heat embossed it in white. I trimmed it and adhered it to the star. 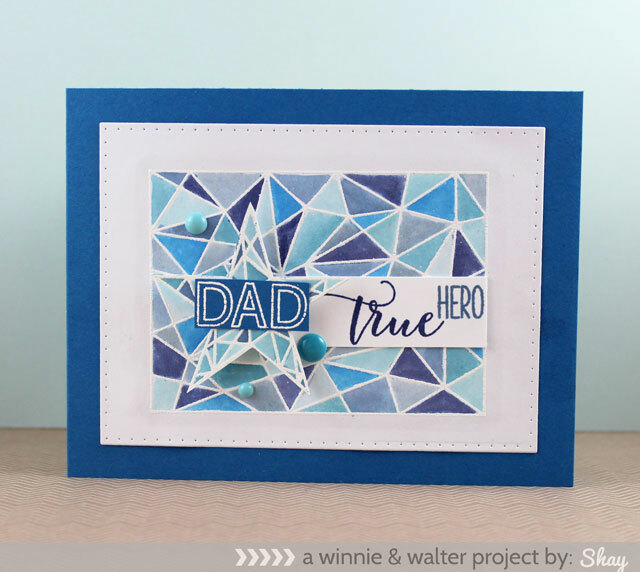 On a pieced of white cardstock I stamped "true" in chipped sapphire and "hero" both from True in stormy sky. I adhered the strip onto the multifaceted panel and then adhered the star with foam dimensional adhesive over that. I adhered the white panel to a bright blue A2 card base. Last I added three enamel dots by My Mind's Eye. Now that I have warmed you up you are ready for the headliners! They stun me with their projects every single time. Enjoy! 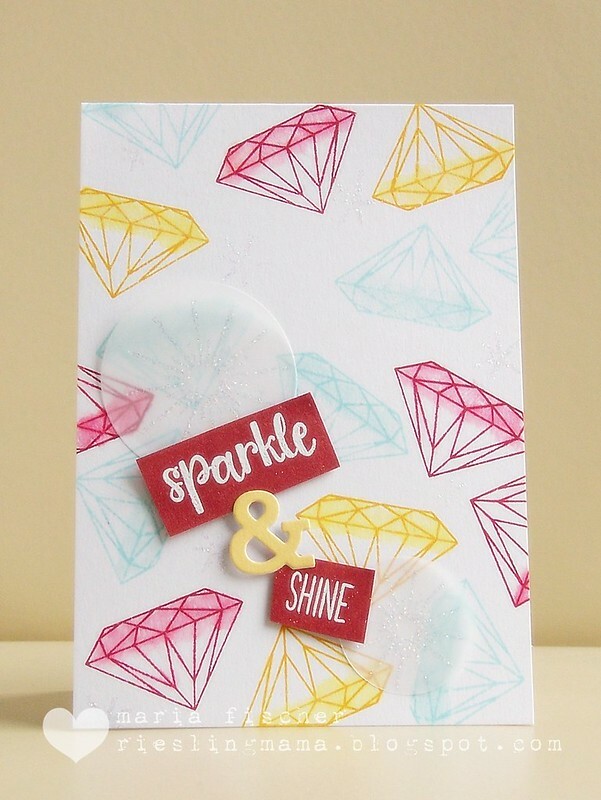 Comment here on this post for a chance to win Mini Scenery: Multifaceted stamp set + My Precious stamp set + Sparkle stamp set+ True stamp set + Cover Model: Multifaceted Cutaway of your own by 11:59 p.m. (central standard time) May 1, 2015. One comment will be chosen at random. What a wonderful release, love all the stamp set in this post and the cutaway for sure! Thanks for inspiration! Awesome release! Love today's projects from everyone! Holy Macaroni, Awesome design team cards! Love the gem theme and the multifaceted cutaway especially. 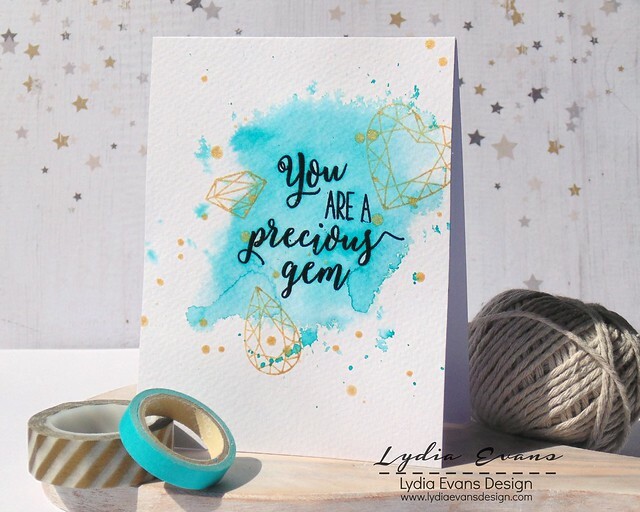 Great sentiments and fonts in all these showcase "gems", awesome cards! These are amazing! I love the look of the A2-sized die and then leaving some of the die-cut pieces intact. Very beautiful cards!!! Great release, W&W! Excellent and awesome cards! The colors and patterns are fantastic! Fabulous creations everyone! Fantastic release, so many "must have" new products. Have been seeing a lot of faceted cards trending lately and today's projects are top notch. Look forward to shopping tonight! Hope you are well stocked, I think this will be a very popular release! oh my....excellent new products and the team...they rocked it, big time! So inspired! 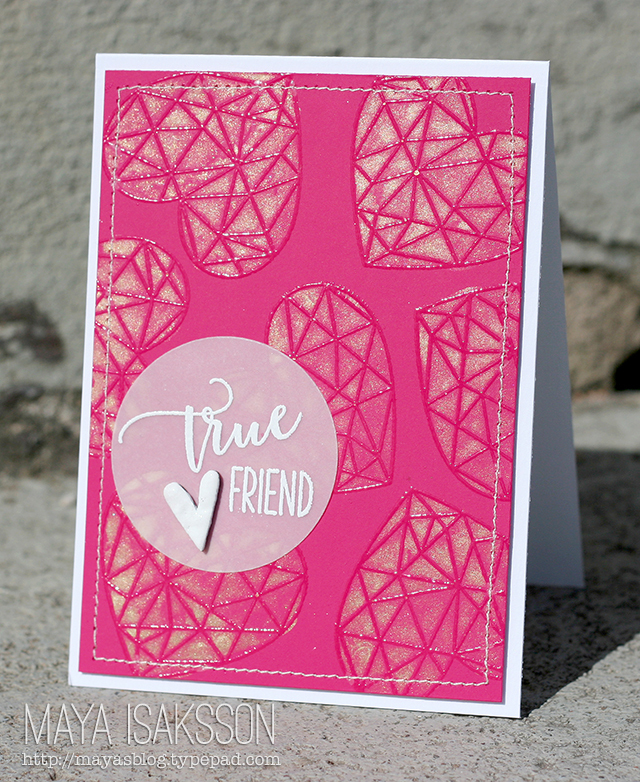 Love these geometrics stamps. What a wonderful release. Thanks for doing this awesome release. In love with the entire line. I love Kelly's fish, great idea!! Multifaceted die is amazing:) thanks! Fabulous new goodies!!! And all of the samples are so super duper fun! Totally awesome! Love everything from today--all the cards are absolutely gorgeous! Great job, everyone! Wel I am blown away! That background die is fantastic! Love how Kelly used it! Such an inspiring release! Oh Boy! I certainly have my eyes set on the multifaceted cutaways and the True stamp set. Fantastic release, ladies!! I am swooning over the cards shared by the Team.. These new sets look like lots of fun! I love the multifaceted!!! 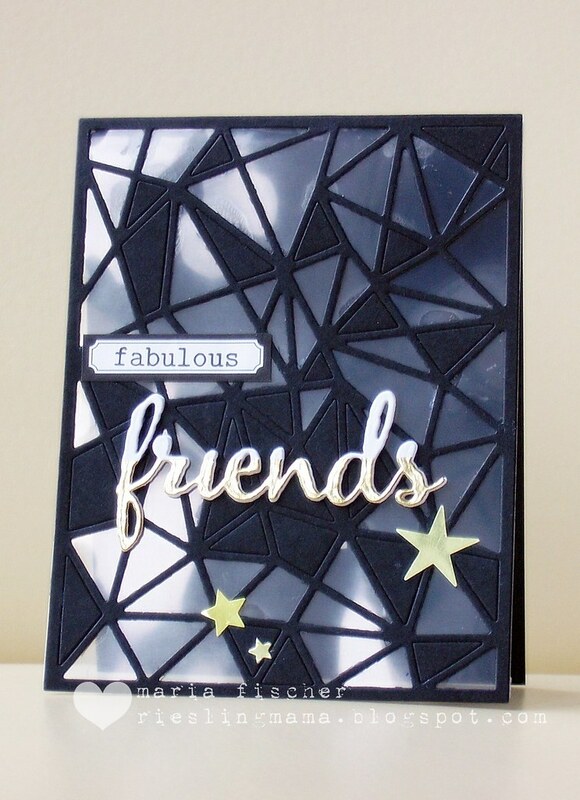 awesome stamps and dies..
Multifaceted is awesome! Love everything...wnderful new release!! Awesome stamps and dies!! Love it! 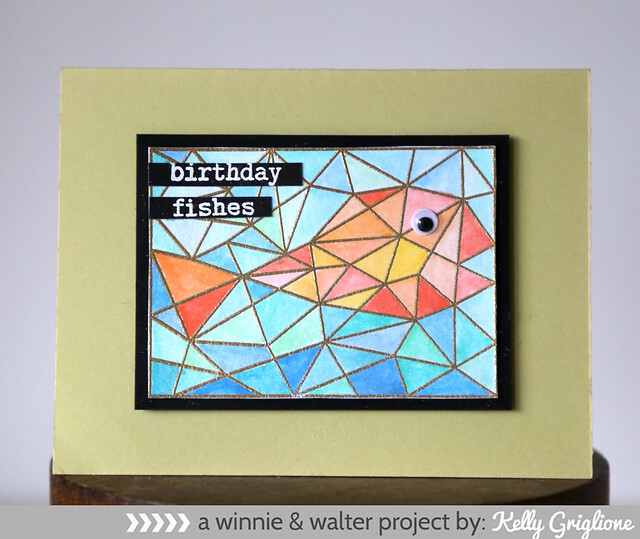 Another day of fabulous samples - I absolutely love the creativity of Kelly's fish card! Fabulous release! Can't wait to purchase. 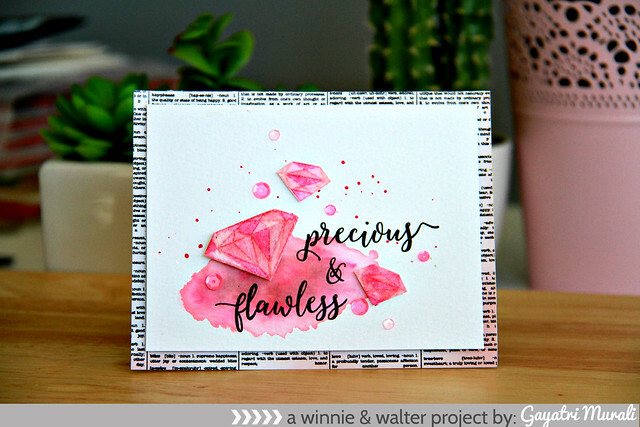 Love all those facets and the great coloring options! 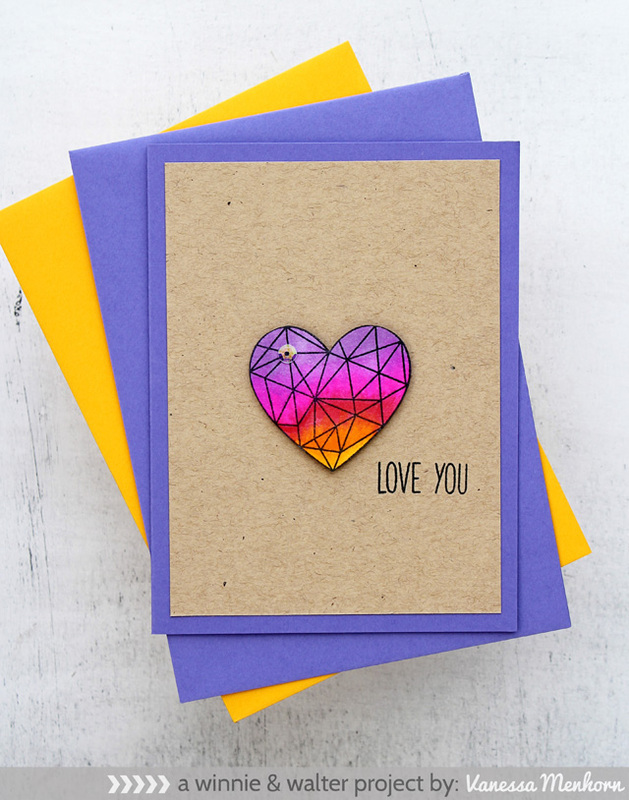 Oh gosh, totally loving that faceted background-it's great for both feminine and masculine cards! Can't wait to get my hands on it! Amazing options for tons of projects with these versatile sets and that die sings to me. Great projects from your DT, as well. These projects are adorable. Love this release. I have to go apply for a loan at the credit union now. 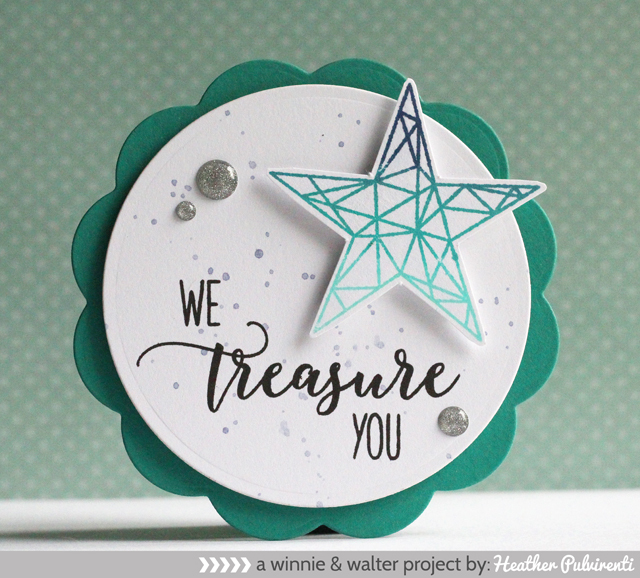 Wow just loved seeing the inspiration today...awesome stamps and dies. Love these awesome projects for this day- gorgeous!!!! I have a lot of nieces and these would be perfect to make lots of girly cards!!!! Love the multi faceted looks- and the "gems" so great!!! Wow, I am really loving the stamps released today, especially the images in the True set. Thanks for all the fabulous inspiration ladies! The cards are really inspiring! Great release! Loving the big cutaway die! 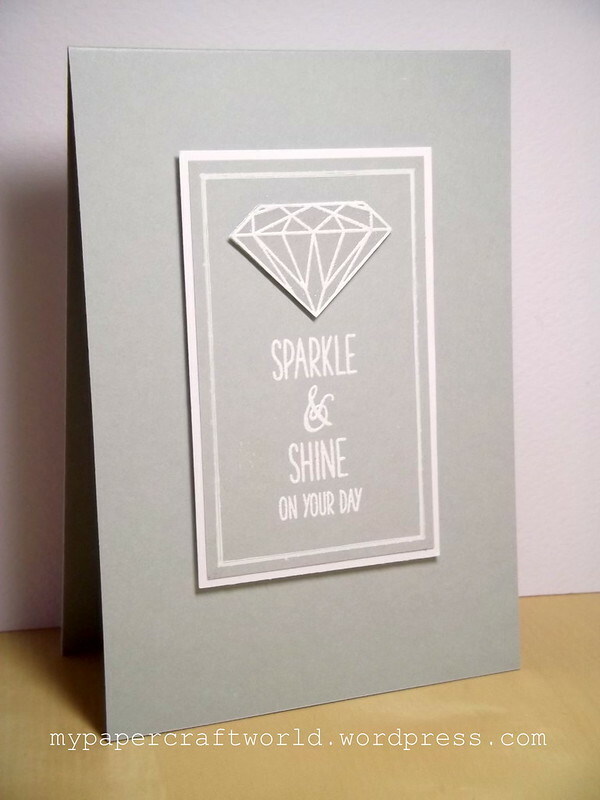 Love all the beautiful cards showcasing your amazing products!!! These are fantastic! 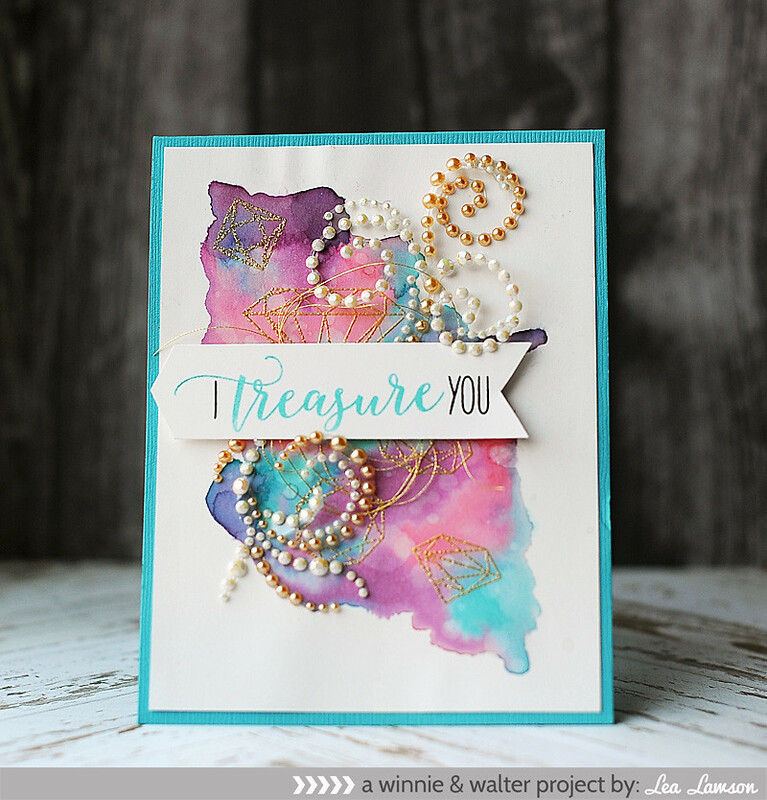 I love the coverplate so much and a great mix of sentiments to go with all the images! Ohhhh gorgeous sets and dies! BTW, I was unable to link up to Joni's blog today. 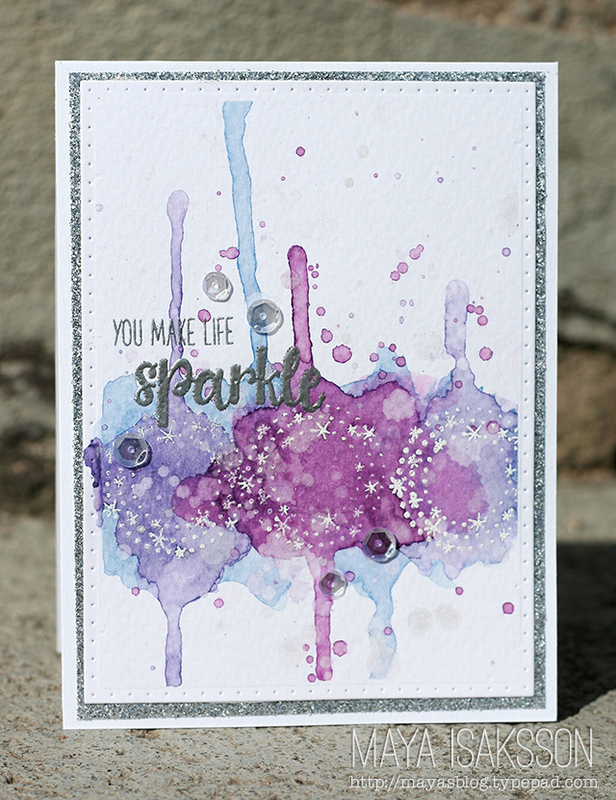 Her card here on your page is amazing but after trying a number of times to link over there, I had to give up! wow! These sets are so cool and graphic!!! Diamonds are a girl's best friend. Love these stamps. the projects are great. Lots of inspiration for using the stamps. I love all of today's new products, so fun and trendy! Fabulous samples from the guests and DT! Loved all the cards! This release is just amazing! 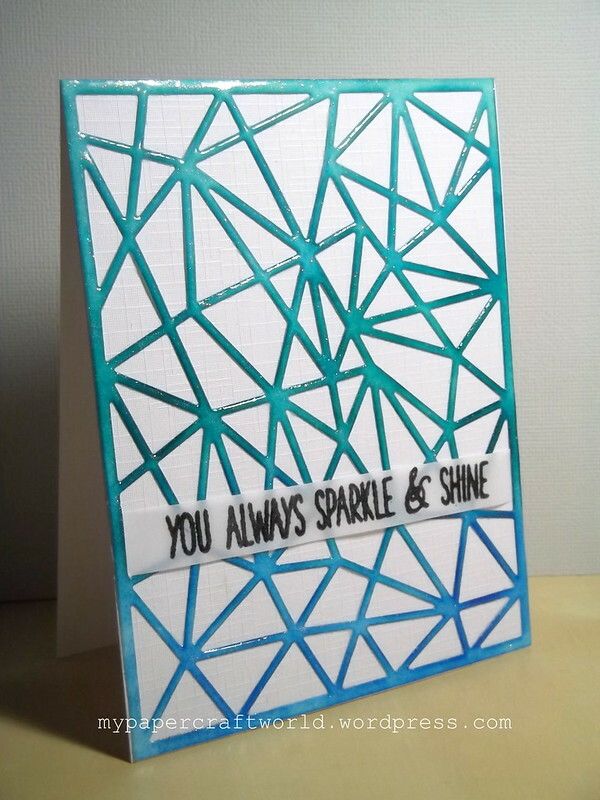 Beautiful inspirational cards!!! And I love all things sparkly and shiny and glittery... so thank you for the chance to win these fabulous stamp sets! To be honest, I didn't think this pattern was my "thing", but after seeing the possibilities from the design team and guests, I'm giving this set a 2nd look! Awesome release! Love the My Precious set and the name is just perfect for it too! Gorgeous cards too! Too cool!! Such a multi-faceted release, lol. Love all the projects. Fabulous. I like all the sparkle and shine. Truly amazing designs and the cards are stunning, cool, hip, so trendy and just so classy looking!! Excellent release from you and your team - super awesome!!! WOW oh WOW!!! This has been an amazing release and all the DT cards have been absolutely stunning! Such incredible inspiration. Like a raccoon, I am attracted to anything blingy! Pretty, pretty, shiny, shiny! I love these cards! I am all about the glitter, so these stamps are perfect! That cutaway is amazing! Love all of these cards! Great products - the designs are simply amazing! The Multifaceted Cutaway is fabulous! LOVE today's featured items! That cutaway die is fabulous!!! So many pretty cards to show off this release! Multi-faceted indeed! Love your DT's inspirational creations! Beautiful!! Such unique creations using those new sets!!! And so colorful! All of the cards are just lovely! I am in love with the multifaceted cutaway!! Great release! Such a fantastic and oh so unique release W&W, wonderful samples by the DT for this one! Ooh! Ah! Love, love My Precious and True! Multifaceted is also a stunner. What fabulous cards the DT and guests have created! 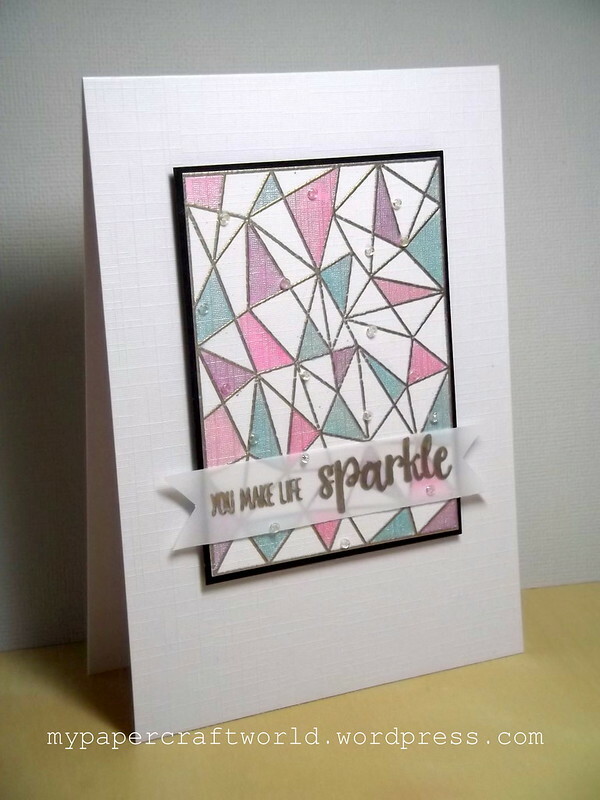 This whole collection is made for me as my OLW for 2015 is SPARKLE! I need everything. Thanks for the giveaway. 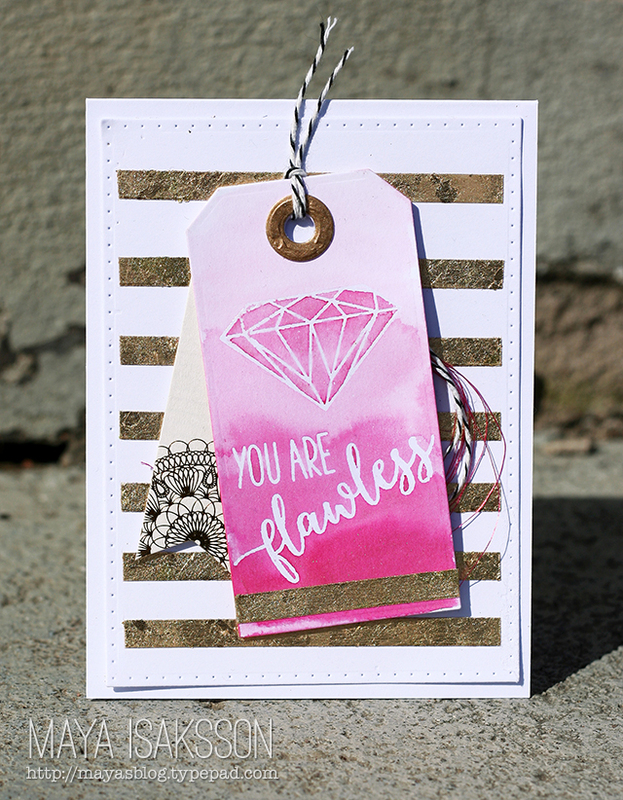 Such beautiful products and wonderful cards to show them off to perfection! What a gorgeous release! Love all the projects! I've been admiring all the new releases over at Instagram and it is just fabulous!! LOVE everything! I love what your guest DT members did with these sets. They are inspiring! Fabulous projects from the DT with these new sets! love!! that coverplate die is so versatile! 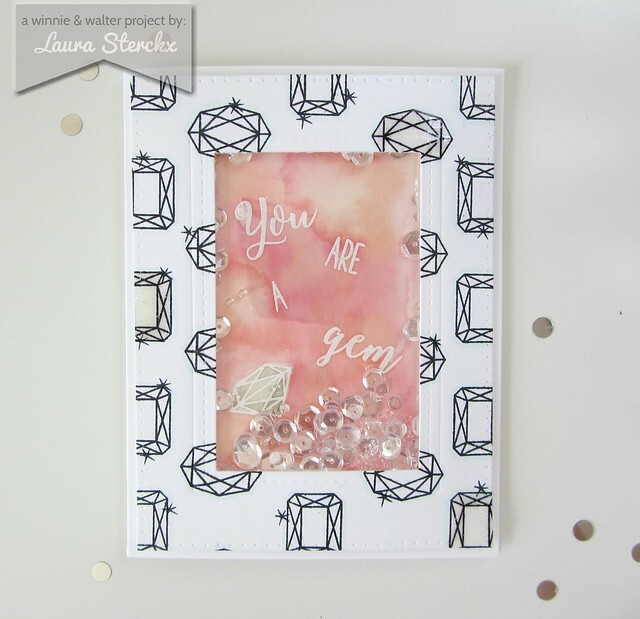 The facets are FABULOUS and the cards they INSPIRED a DELIGHT!!! Wow. 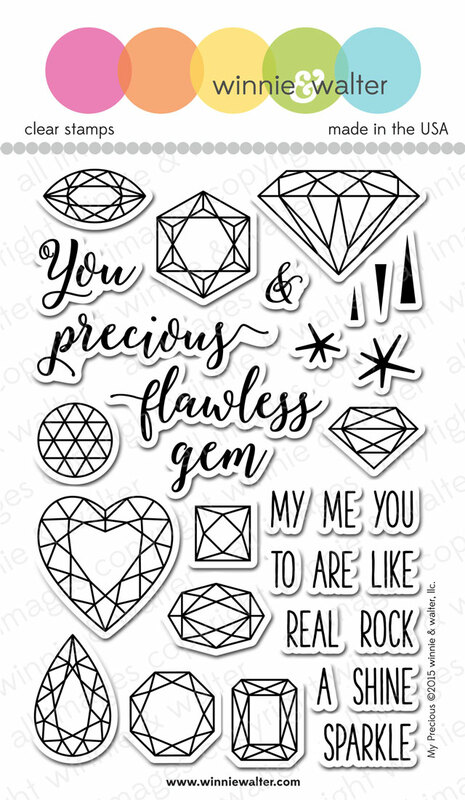 Look at all these gorgeous gems that your talent created with your new stamps!!! So beautiful and amazing!! Wow! These stamps are GORGEOUS!!!! The cards made using them are oh-so-pretty!! :) Love this new release! Wow! The versatility of this set is unlimited!! I would so love to win this!! I love everything about this release! 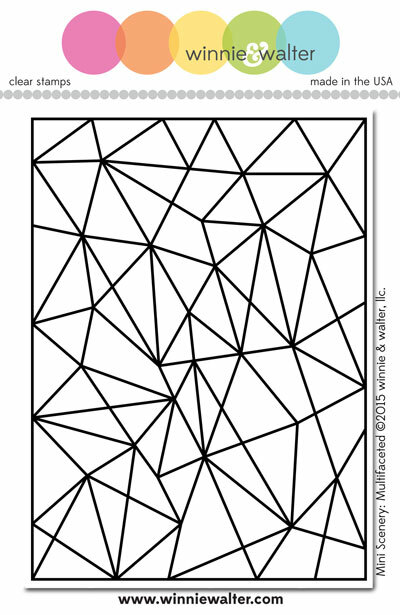 The faceted images are wonderful! Stunning release - I love absolutely everything. The teams creations are all amazing. I really love your products. There is so much versatility. Love how the creative team use the products. Wow! The multifaceted cutaway is a great die! I love it! Thanks for today's inspiration! Wow! Fabulous projects! This release is awesome!!! Awesome projects! Love the variety! Thanks for the inspiration!